It is a well-documented fact that millennials are obsessed with food. Though, to be fair, most humans are as it’s essential to live. 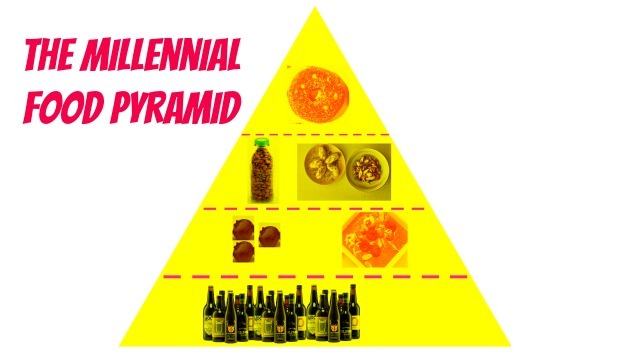 Perhaps it’s more that we’re obsessed with how millennials are changing food. Millennials are spending $96 billion a year on food, and changing the food industry on every level. We’ve considered literal levels of food, and updated the food pyramid to match the current generation’s $96 billion eating habits. Enjoy this totally legitimate* breakdown of what millennials are consuming on a regular basis. *We are not dieticians or scientists and this report is not legitimate in any way. The top tier of the food pyramid, once reserved for indulgences like fats and sweets, can now be occupied by guilty pleasures of a different kind. Millennials love a good crafted cocktail, preferably in a vintage coup glass or a copper mug. The legalization of marijuana has expanded the millennial’s selection of snacks, often in the form of sweets or candies laced with something mind altering. Millennials love things that look like other things. Phone cases that look like cassette tapes. Cakes that look like hamburgers. Almonds masquerading as milk. What was once a viable option for lactose intolerant people and vegans is now a millennial fridge staple. Because who doesn’t like a thick cream with their cereal? Much can be said about the small plate. So satisfying in its utter lack of pretense: it is literally a small plate. They consist of small portions usually meant to be shared, appealing to the millennial’s sense of community and frugality. Of course, this appeals to their love of irony as even though they are the smallest portions on the menu, they are also often the most expensive. Small plates usually include cheeses, nuts and fried things helping millennials keep up their energy while drinking their speciality cocktails. It’s a bird, it’s a plane—nope, it’s an overhyped food trend. Superfoods are nutritional and versatile. Think acai, blueberries, chia seeds. They’re the perfect starting point for a food craze that ultimately ends up on a T-shirt in a Beyonce video. Superfoods are exactly what one needs when they want to seem healthier (and therefore morally superior to) others. Say it with me now: Keen-wah. First plates, now bowls. Bowls, of the rice or smoothie variety, are compact but still full of a color wheel of foods. They are nutritious and good for someone who likes variety. Most importantly though, bowls contain key supplements for Instagram-worthy pictures. Everyone from breweries to Haagen Dazs has learned the appeal of slapping the word “craft” onto their merchandise. The millennial loves the idea that something was made just for him. We have the craft beer, the locally sourced, handmade ice cream, the carefully constructed doughnut hybrid. This tier of the food pyramid covers a wide range of foods to be consumed profusely. Includes everything from organic avocado toast to artisanal cotton candy.